The Greater Ardoyne Residents Collective in a statement released today 28/06/2016 offers its analysis on the latest parades issue development in North Belfast. Since partition and before, the Ardoyne Community has borne the brunt of naked sectarianism in our city. In every generation, our community has proudly resisted against the evil forces of the State and Loyalism that view our people as sub-human, inferior and dirt. Despite over a century of discrimination, inequality and the slaughter of our family and friends, the people of Ardoyne have refused to bend the knee or submit to those that have sought our surrender, eradication and destruction. One of the crudest manifestations of Unionism's superiority complex has been their continual demands to march through areas where they are not welcome. For decades now, the Loyal Orders, assisted by political unionism and Loyalist paramilitaries, have gleefully trampled over the right of Ardoyne residents to live free from sectarianism. These parades have invariably been accompanied by heavy militarisation of the area, restrictions on freedom of movement, violence, injury and the criminalisation of our young people. The people of Ardoyne have protested against this by whatever means necessary, with the correct analysis being that the Loyal Orders should march where they are welcome to avoid all of the above. GARC was established in 2010 in order to advocate for local residents and campaign against these parades. GARC commissioned a research company to undertake an independent survey, with 85% of over 1100 respondents opposed to ALL sectarian parades. It is from the people's responses that we developed our analysis and strategy. GARC are resident-led and inclusive of ALL political viewpoints and those who simply live here and wish to see an end to sectarian parades. GARC refuses to come under the influence of any political party. We have met with every group, church or delegation that has requested engagement. To date the only organisations that refuse to meet with GARC are each Loyal Order and Sinn Féin. Since our inception we have organised scores of protests and pickets against sectarian parades. In 2010 GARC organised a sit-down protest and were forcefully removed from the Crumlin Road after Sinn Féin demanded the PSNI take action. Almost 30 residents and supporters were subsequently prosecuted, with many going to jail. Subsequent counter demonstrations against Loyal Order parades in 2011 and 2012 were attended by thousands, peacefully showing their opposition to sectarian parades. As a direct result of these initiatives, supported by the residents of Greater Ardoyne, the Parades Commission has banned every evening parade since. The result of this long overdue decision has been a constant sectarian hate camp, nightly sectarian parades, the intimidation of residents, saturation of the area by PSNI and British Army personnel, harassment of local businesses and a loyalist paramilitary-led campaign to browbeat this community into submission. It has failed. While the UVF, Political Unionism and the Orange Order have been unable to break the backs of Ardoyne residents, recent events have shown that they have broken Sinn Féin, with the promise of funding also influencing their capitulation. This party agreed to a deal that would have rewarded those who have put our community under siege, and were hiding both their "negotiations" and agreement from the community until it was exposed by GARC. They now attempt to spin that allowing an Orange Order victory is actually a victory for residents. The truth is that they cannot deliver on promises to the UVF and Orange Order that there will be no residents' protest against further sectarian parades. GARC will continue with our strategy. It is an agreement they have no power to implement. Let us be clear. With no demand to parade there would be no denial of rights to residents, no restriction of movement, no militarisation of the area. There would be no resultant violence, no criminalisation and demonisation of our people. There would be no £21million of taxpayers' money wasted. There would be no impact on local businesses or amenities. There would be no hate camp or nightly parades. Our children would not be exposed to the vicious sectarianism central to the Loyalist ethos. None of this is residents' fault for asserting their rights, rather it is the result of Loyalists' false sense of superiority over their neighbours, based on religion and/or political outlook. Harmony Lane alternative route provides a solution to all of the problems associated with, and inclusive of, sectarian parades through our area. This is the only win-win for all sides. With the correctly predicted failure of the farcical Roddy/Good process, it should be supported by all stakeholders and those willing to engage. For our part, GARC remain willing to oppose ALL sectarian parades and will reject any sordid deal between a political party and loyalist paramilitaries that rewards the Loyal Orders for putting our people under siege for the last three years. 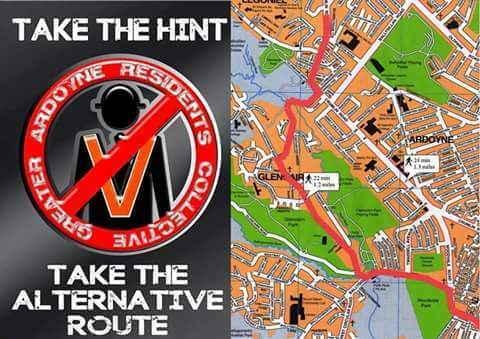 The OO won't move as there is a loyalist enclave in Glenbryn and if they pulled back the parade route it would seem in their minds that they were deserting them. Glad I don't have to put up with this crap anymore. If you want to parade in Ireland it must be mandatory that you have to do it naked. Sort this nonsense right out! The OO in Newtoncunningham between Letterkenny and Free Derry just got planning permission for a new hall. The last one has been a black patch since it was torched in 2014. Anthony McIntyre and Tommy McKearney were at one stage chief suspects having been photographed inside the building shortly before it went up in smoke. It has always struck me as a very odd tradition, that of marching from church services to burned out Orange halls. Usually in a state of drink and drug fuelled sectarian anger. People iz what people duz. Used to my drugs off an ex-shinner from Oldpark. Misspent yoof! Still say parades should be naked, see who's really commited to their cause! If acompanied by an 'ugly-tax' Steve that could be a decent idea. National debt wiped out in a single weekend.